Shou Hayate/Change Pegasus- He entered into the military hoping to find girls in the process. Kenta/Black Mask- He is the one with the most women in the series. He had Miyuki in episode 7, Yui in episode 11, Yoko in episode 13 and Seira (who is actually a monster) in episode 26. I kind of liked his tandem with Yui the best. Youhei Hama/Blue Turbo- He chases around girls in the campus, maybe the source of his low grades? 36/70 found it by search engines like Google. Hmmm Sean Akizuki has become a new key word hasn't it? 32/70 found it by being linked by other bloggers. Hmmm I can just ignore the rest. Hee hee. This is one HOT episode... literally. So why? Well the girls are on the way to view some fireworks. The new monster Zaigo (almost sounds like that $#! of a show called Zaido) has a plan to make people feel too hot inside and cause a simultaneous release of freon in the air, to cause global warming because people will be forced to stay too long in the airconditioner. They have to put him into a tank of water to cool him off. They eventually see battle to where there's also a perversity moment of the girls' tops flying off (but nothing seen) who were about to be given a firework-themed death. The episode ends with a beautiful firework display with Hyde in a cold. I think it has to do with the cast of characters. 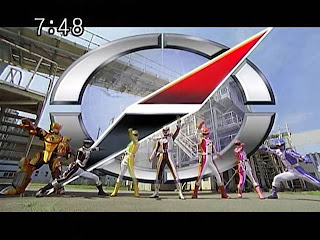 IMO the Dekaranger cast is more well-balanced than the SPD team with how each one's strengths and weaknesses are shown and balanced throughout the whole show. Each one of them had funny moments, even the serious guy like Hoji Tomasu who I felt triggered every positive and negative emotion of the viewer more than the others. Some of them I felt were so MMPR in personality like Hoji Tomasu, Jasmine Reimon and Tetsu Aira. Also I think the hot babe Ayumi Kinoshita may have played a role in it too. 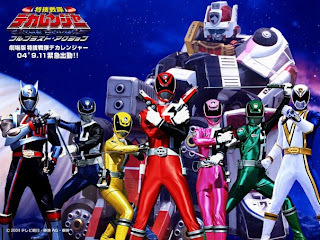 I think it has to do also with how the script was written and its one-of-a-kind storytelling which is kind of different than the typical PR/Sentai expectation. There was the right blend of seriousness with humor. Timeranger and Time Force anyone? According to DancingAlienDude, he feels like the main characters are as likable as the MMPR cast. I agree although I can only see Power Rangers similarities to Satoru (Tommy), Souta (Billy and to an extension Kai of Lost Galaxy) and Sakura (Kimberly and maybe with Jen from Time Force but she's sweet as Kimberly even if she's tough). I kind of thought that Masumi is like Leo in Lost Galaxy and Natsuki is more likely a parody of Maya in Lost Galaxy. 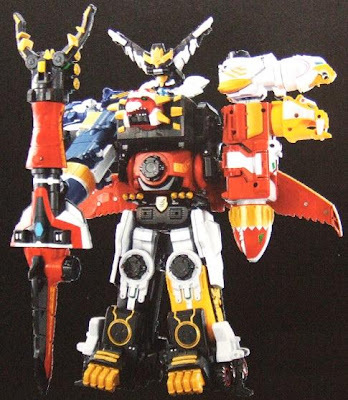 As for Eiji, I think he's probably another tribute to Tommy or maybe to Ryan in Lightspeed Rescue who was an original ranger by Saban. The most interesting part for me in Boukenger has been the Lemuria side story. Why? Well it's been the myth that's been more focused than ever. You can read about the fictitious place from wikipedia at: http://en.wikipedia.org/wiki/Lemuria_%28continent%29. It has several accounts of it sinking beneath the ocean, although in Boukenger it was never specified to why it sank but different writers had their different ways of telling the story. In episode 29, the first references to Lemuria are both the Lemurian egg and the Golden Sword (who is also Zubaan). Evil men can't use the Golden Sword as shown. The Lemurian egg was necessary to hatch the dangerous Lemurian Beast which was defeated by the Golden Sword. This was the legendary beast of destruction that was created from the Lemurian egg. 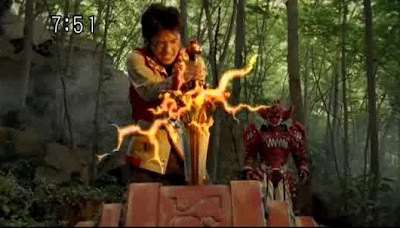 The first one was destroyed in episode 29 by Bouken Red who did a high jump using the Golden Sword. A second one was created by Gaja with the Gordom Engine. Adding a villain that opposes both the rangers and the enemy organization. Villains who reformed and lived to tell the tale. When the final villain isn't the main villain. My favorite example is Dr. Lee Keflen. The Flashmen and the anti-Flash phenomenon. This added height to the drama as the Flashmen fight to defend a world that's not their home anymore and that sooner or later, they will be destroyed. Also, the fact they refused the cure is another. When the main villain isn't introduced directly. It adds some suspense to the show. Vulgyre was an example where he used a projection that was called "Empress Meadow". When the final villain has an ironic defeat- for example Exhaus was however defeated by just plain imo-youkan even when he defeated all their mecha. Ironies do exist after all. Takeru Shiba/Shinken Red- As a red ranger, I kind of find it something that he's also named Takeru after Red Mask. What of his personality? He can appear to be quite isolated, can be such a hothead and turns out to be a really nice guy like Takeru in Maskman was. He also has a stupid secret which got the others to laugh when it was discovered though his was less embarrassing compared to Red Mask's. He also has a fan-pairing with the pink ranger Mako Shiraishi like Takeru has with Momoko/Pink Mask. He is also the type that despite the fact that they discovered he was nothing more than a decoy for the true leader, he has friends who truly care for him. 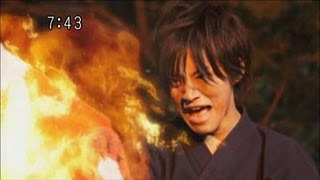 Relation to fire: Takeru Shiba has a very fiery personality, a nasty temper at times and like fire, he is quite destructive. How do you find the mecha overload lately? 18/42 said that it's okay. 24/42 said to cut down on the mecha. Where do I stand? I want to cut down on the mecha. I think it's time to be a little more old school. BTW I am deleting blog entries I feel should be removed for good reasons like irrelevance.